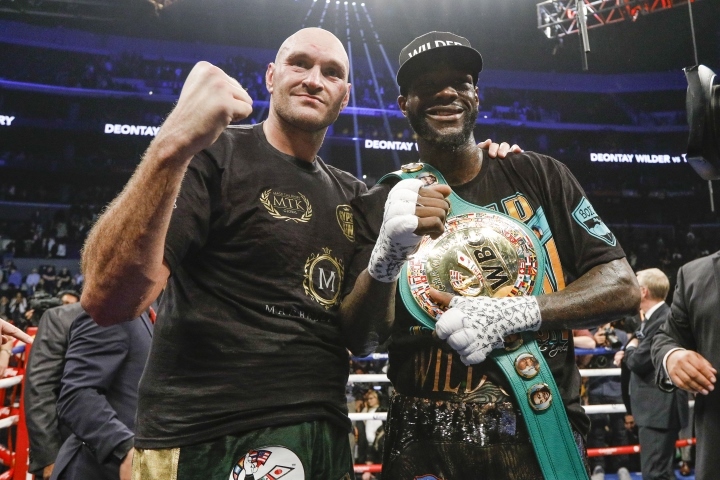 Wilder: Everything Fury Gained, He’ll Lose it By Facing Schwarz! The WBC heavyweight champion looked set for a rerun of his dramatic draw with Fury next month. But Fury pulled the plug on talks when he signed a mega-money deal with US broadcaster ESPN and promoter Top Rank. Fury is now facing little-known German Tom Schwarz on June 15 in Las Vegas but Wilder says his rival could “stink the place out”. The unbeaten American said: “He will have to suffer the backlash from the people. “That is one thing Americans don’t like is you say you want to fight nothing but the best then when it is a controversial fight you get the rematch and you run. “Tyson Fury doesn’t have an exciting style, he can easily stink out a place with his style. “People don’t want to see that in America. They don’t want to see you just boxing and being boring. “They want to see excitement with the big boys, they want to see knockouts. “If I don’t give Tyson Fury the rematch ever again in his life that will be his problem. ESPN is going to be s***ting bricks and so will he. Wilder turned down an £80m three-fight deal with DAZN last month which would have paved the way for a clash with IBF, WBA, IBO and WBO champion Anthony Joshua. The American is sticking with US broadcaster Showtime for now and will defend his WBC belt against Dominic Breazeale on May 18. He added: “I think the Joshua fight will happen but I don’t know if it will happen in the next year. Wilder: Joshua is Too Stiff, Fury Beats Him on Any Given Day!